Game description: The sequel to Grandia puts you in the role Ryudo, a young bounty hunter who travels the lands looking to sell his sword to the highest bidder. With your hawk friend Skye, you'll embark on a journey filled with puzzles, battles, and thousands of characters. In order to survive the battlefields of Grandia II, you'll need tactics, skills, and technique. Unleash the hero within and face your destiny as you defeat enemies across expansive 3D landscapes. 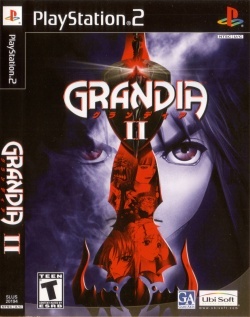 Grandia II is set in a fantasy world thousands of years after a battle between Granas, the god of light, and Valmar, the god of darkness, nearly destroyed the planet until Valmar was split into pieces and scattered across the land. In the aftermath of the battle, the Church of Granas has led humanity to prosperity by spreading the word of good, but when a young mercenary named Ryudo is charged to protect a songstress from the church named Elena, their journey reveals that the church's history, as well as the history of the world, is not all it seems. Runs above full speed. Floor textures disappear in combat. Description: This happens from time to time, gray texture blocks may appear on the floor in battles when the camera moves around. The cause of this is unknown. Workaround: Nothing works to fix this. ZeroGS does not solve the issue. Software Mode of GSdx will not solve the issue too. However, this is a minor issue and does not detract from actual gameplay. This page was last edited on 16 April 2019, at 08:16.